Exceptionally maintained home in an all brick building, on a beautiful tree lined street in Graceland West. 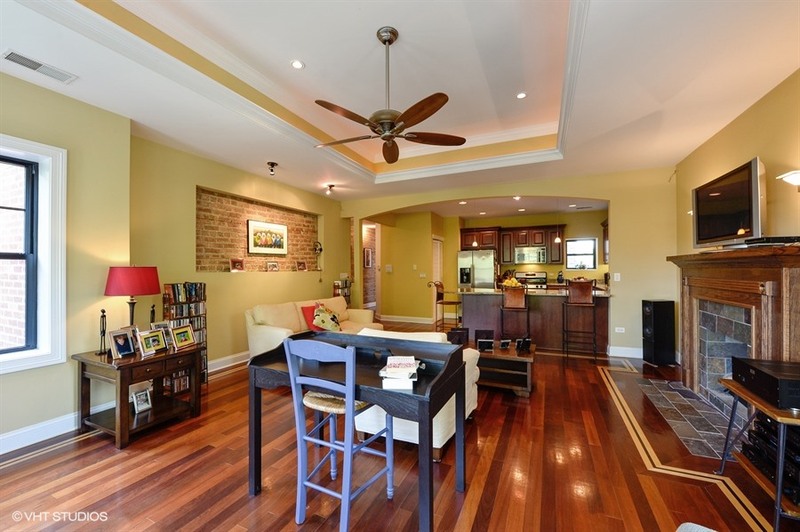 Gut rehabbed in 2004, with outstanding attention to detail in this extra wide, top floor unit. Opened concept kitchen, living and dining rooms, complete with custom mill work and in-laid details on the Brazilian cherry floors. Large windows for natural light, and a gas fireplace completes the living room. The large kitchen features granite counter tops, 42" cherry cabinets, stainless steel appliances, and a long breakfast bar. The wide hall with exposed brick leads to the full hall bath, and two large bedrooms at the rear of the home. The master en-suit features a jacuzzi tub with separate steam shower, and dual sinks in the vanity. Stained glass accent windows complete the bedroom. In-unit washer and dryer, along with one parking space and storage locker are included are included in the purchase price. This home is 1/2 block from Southport, and across the street from Neighborhood Park.